In 2014, Darling Ingredients’ Ecoson Energy Park, located in Son, the Netherlands, opened the biophosphate component of the sustainable production complex, designed to create green gas and natural organic fertilizer pellets rich in phosphate from local farmers’ pig manure. Pig farming is a large and important piece of The Netherlands’ agricultural sector, and with it comes the challenge of how to handle the surplus of phosphate-laden pig manure. Phosphate is vital for agriculture and food production, but too much is harmful. With the opening of this facility, Ecoson is helping to close the loops between the demand for biophosphate in phosphate-poor agricultural areas and the phosphate surplus in the Netherlands which exceeds government restrictions. Ecoson’s new plant has a processing capacity of 100,000 metric tons of animal manure per year, from which approximately 6,000 mt’s of biophosphate pellets will be produced annually. In addition, the production process generates enough green gas to supply energy to approximately 1,700 local households each year, reducing CO2 emissions by approximately 4,500 mt’s per year. 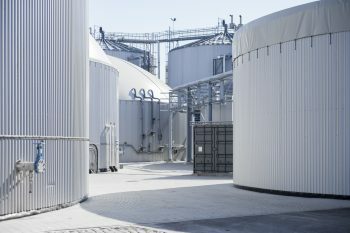 Ecoson Energy Park, the largest sustainable energy park in The Netherlands, has been in operation since 2007, producing green gas, electricity, natural fertilizers and feedstock for second generation biofuels from animal fats and by-products. The Ecoson EcoZone was established in 2013, an environmentally-friendly greenspace with walking trails and a pond supplied by the plant’s treated and clean wastewater, providing a lush, green habitat for nature, wildlife and the community’s enjoyment.